An Islamic State (IS, formerly ISIS/ISIL) flag and a bomb were found at a house in a Brussels district during a search conducted by Belgian police in connection with Tuesday morning blasts, prosecutors said. 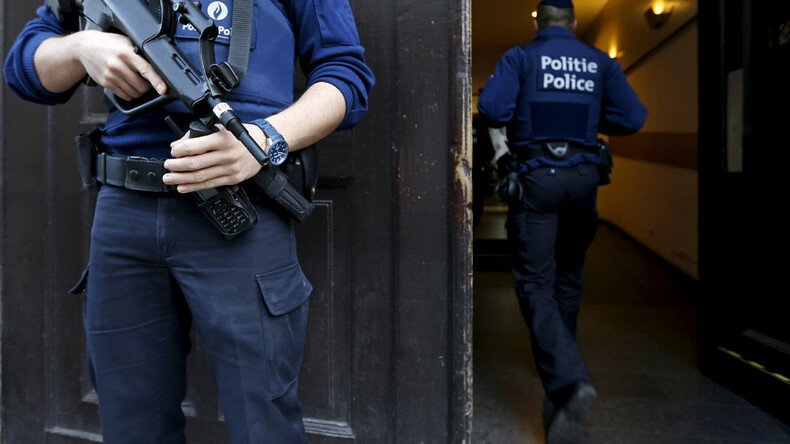 The explosive device found at a house in the Schaerbeek municipality contained nails, Belgian prosecutors said. Some chemicals were also found during the search. Raids are being conducted all across the country in the wake of this morning’s terror attacks, Belgian federal prosecutor Frederic Van Leeuw announced at a press conference. The official added that a possible connection between the Brussels blasts and the Paris attacks is still being investigated. Three male suspects were captured by CCTV at Brussels Airport before the deadly blasts, the prosecutor said. An image showing the three men has been released. Police have released a wanted notice for this suspect, with Reuters reporting a government official as saying that the man was seen running away from the airport building. More explosive devices were found at the airport in the evening, the Belga news agency reported, citing a police source. According to another law enforcement source, a suspicious object was neutralized by bomb technicians at the airport, which is still cordoned off. 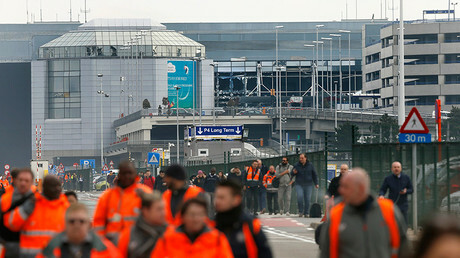 Belgian authorities confirmed earlier in the day that a third unexploded device had been found at the airport, saying that it was destroyed by security services. Twin blasts went off in a busy departure hall at the Brussels airport on Tuesday morning at around 8 am local time, claiming the lives of at least 14 people. Another attack in the Belgian capital targeted Brussels’ Metro, killing at least 20 people at the Maalbeek station, which is located close to EU institutions in Brussels. Around 230 people were injured in the attacks, the Belgian Interior Ministry’s Crisis Center has reported, while stressing that those figures are not final. 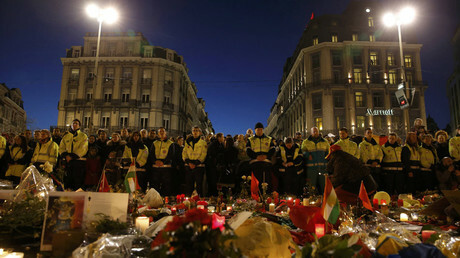 Three days of national mourning have been announced in Belgium. IS has claimed responsibility for the Brussels attacks, according to the AMAQ agency, which is affiliated with the militant group. The Tuesday blasts came just days after Salah Abdeslam, the prime surviving suspect from the Paris massacre in November, was arrested in the Belgian capital. The 26-year-old Belgian-born French national was detained during a raid on March 18 and formally charged with terrorist murder. Several other people were arrested in the raid and charged with involvement in terrorist murder, being members of a terrorist organization, and aiding and abetting criminals. The suspect’s lawyer told the media that his defendant was cooperating with Belgian justice officials. Paris prosecutor Francois Molins said that Abdeslam told investigators that he had initially planned to blow himself up in the IS-orchestrated Paris assault, but later “backed down.” Belgium’s minister of foreign affairs, Didier Reynders, said Salah Abdeslam had confessed to planning a new terror attack, and confirmed that security forces had found many weapons during his capture. He has reportedly been placed in a high security prison in Bruges.